Around the Garvey household, we realize we have a lot to be thankful for. Jay’s health is improving by the day, and he is in the process of resuming all normal activities. This includes checking into the simplify 101 private community forum. One day last week, he noticed that our community leader Kelly had started a daily gratitude forum, a tradition that sprung from my Get Organized for the Holidays and Goals online classes. Knowing that Jay has a lot to be thankful for, he joined the conversation and shared his gratitude. The first day was easy. Later that day, Jay and I went for a walk and chatted about the day’s events. He told me he had posted that he was grateful for his family and how much we loved him, something that became really clear to him while he was in the hospital and recovering at home. He then said he regretted using the big thing he has to be grateful for right away. What will I come up with for tomorrow? Jay isn’t alone in his feelings. Over the years, his thoughts have been echoed many times in our online forum. People fear that if they start sharing gratitude either in a forum, or in a journal, that they’ll run out of things for which they are grateful. Or, perhaps what they feel grateful for seems insignificant. 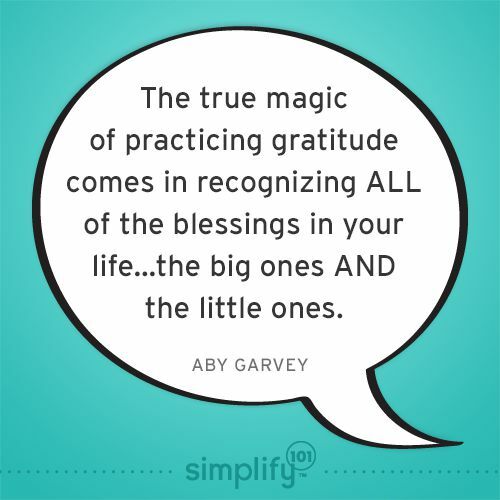 As Jay and I contemplated his dilemma, I shared with him that for me, the true magic of practicing gratitude comes in recognizing all of the blessings in your life—the big ones and the little ones. Your perspective on life, and the world, begins to change when you begin to notice, and even look for, the little things you may have missed before. Noticing the beautiful silhouette of tree branches after they’ve lost their leaves, or feeling truly grateful for your warm home, clean sheets, or a traffic-free commute can change your outlook on life. As we enter the final stretch before Thanksgiving, I invite you to begin a gratitude journey of your own. If you’ve never made giving thanks a habit, why not begin today? Pull out a journal, a notebook, or a scratch piece of paper if you’re not sure you want to commit, and jot down a thing or two that you’re feeling grateful for today. Don’t worry if it’s too big, or too small, or if you gave thanks for it yesterday. Just let your mind notice the blessings in your life and let your hands record them on paper. When you do, you’ll be amazed at the good it does for your heart and soul. If you decide to give “giving thanks” a try, please let me know all about it in the comments below. You’re welcome to share what you’re grateful for today! P.S. Jay and I want to give thanks to you! Thank you for the outpouring of love and support as Jay was recovering from his “medical event.” It means more to us than words can express. I have been keeping a gratitude journal for quite awhile and without a doubt most of the things I am grateful for our the little things. I can also say, from my own experience, that the studies that show keeping track of your gratitude helps to combat depression are absolutely true! it took me awhile to establish the habit, but once I did, I no longer struggled with depression like I used to. Thanks so much for your comment, Kelly! I’m so pleased to hear that practicing gratitude has helped you combat depression. It is so powerful, isn’t it? Thanks for sharing your experience! This is a great reminder of exercising our gratitude “muscles.” So often we believe that we are appreciative and grateful people but if our thoughts aren’t daily counting blessings or we are not listing or saying thanks, then we have to ask, are we really? And for Christians, we’re taught to “give thanks in all circumstances,” which means we must be thankful for everything, the trials and problems we have as well as the triumphs and blessings; for in those trials we might find later on some good that came out of them, even if its our personal growth. I have seen some very close to me who struggled severely with depression and I agree with the poster above who says (and don’t get me wrong, I am not saying a cure or cure-all especially for clinical depression) that it helps keep depression at bay. Thank you for sharing your thoughts Paige! Thanks for the article and the reminder to start to think about things we are grateful for. A very little thing for most people: my husband and I have two indoor cats and a outside cat that we feel is ours and love. He has been missing for the last few days, and today we found him dead on our back porch. I’ve been crying, of course, but am glad he was loved by us. Glad he was part of our life. I think an animal’s life is a reminder to us to LOVE all of God’s creatures, especially those friends and family members we take for granted. Blessings on you and your family and your readers during this season of gratitude. Oh, Stasia, I’m so very sorry hear about the loss of you cat. Sending you love and hugs.